San Diego’s best bites span a vast number of world cuisines—and a huge range of prices. You wont find any white tablecloths at these delicious establishments. What you will find is some of the best eats in town, served from trucks, diner griddles, homegrown chains, and hole-in-the-wall gems at prices that may seem too good to be true. Affectionately called the Dirty Flat Top Cheeseburger, the $5 signature dish at this new hole-in-the-wall diner, topped with caramelized onions, garlic aioli, and American cheese, has gained a devoted following. If you need more greasy goodness, they also have pizza by the slice, Coke in a glass bottle, and beer, amidst an ambience that combines 1950s diner with a hipster-foodie aesthetic. One of San Diego’s favorite homegrown chains, The Kebab Shop sticks closely to its name, offering a narrow but delicious array of Middle Eastern staples including falafel, chicken, lamb, or beef, in a flatbread wrap or pita (each for under $9), or on a salad. 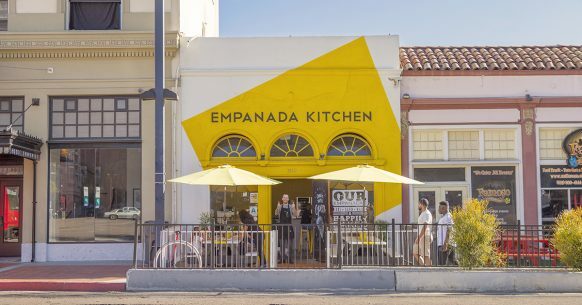 With a half-dozen locations from Encinitas to the East Village, this quick eatery is never too far away, and always hits the spot. Say aloha to pan-Pacific bites like musubi ($2-$3), saimin noodles ($4-$7), and plate lunches ($11-$13). Don’t worry if you can’t make it to their Honolulu location; there one in Pacific Beach and another, coming to Oceanside, this year. San Diegans know their Baja-style tacos. And many of them choose to get their grilled fish and cabbage from this food truck, reliably parked in a lot at Texas Street and Meade Avenue in University Heights. This family-owned business is run by a clan from the town of San Felipe, on the Sea of Cortez, that dishes out fish, shrimp, or octopus tacos ($3-$5), ceviche, and other mariscos. There’s no California-style pie at this Hillcrest institution. No avocado, no pineapple. Just terrific New York-style pizza by the slice or pie with toppings like anchovies, black olives, cherry peppers, and meatballs. Cheese slices are $2.50 (and 50 cents for additional toppings), or you can opt for the $7 lunch special that includes two slices and a drink. Served with a side of East Coast attitude. At this Argentinian spot in the East Village, $3.50 gets you a handmade empanada served in a cute modern setting. The various empanada shapes like fringed edges or a half-moon configuration tell you whether its beef, chicken, sausage, ratatouille, broccoli, or other fillings inside. Baja and American diner cuisine are fused into a uniquely delicious breakfast and lunch menu at this establishment a stone’s throw from the Crystal Pier. Not sure if you want Baja-style tacos and burritos, or just a stack of pancakes, eggs and bacon? You can get both at prices more suited to the year this placed opened—1991—under the same roof.